Hello. I’m David White and together with my son William, my wife, Rosemary and our good friends and colleagues John, Mari, Tim and Peter, we run BHP TrackDays Ltd. I try to update this site regularly with posts about all things useful concerning the track days we run at Castle Combe Circuit in Wiltshire. I hope you find this site useful and informative. BHP TrackDays has been in operation since 2002, and although we have operated at other circuits, we specialise now in high quality open pit lane track days at Castle Combe. 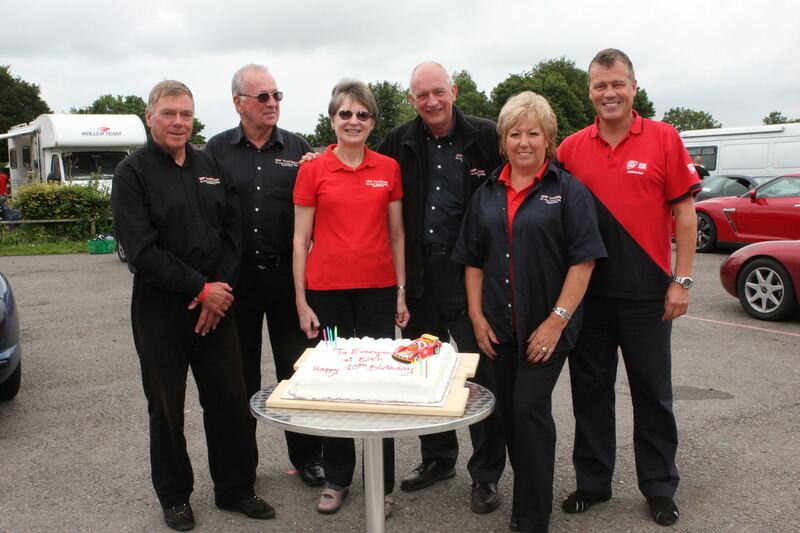 This the team celebrating our 10th birthday! As a company, BHP is an active member of the Association of Track Day Operators (ATDO) and in fact I’m currently a board member of that organisation. The ATDO is run by volunteers and sets the standards for car and bike track days in the UK. As an ATDO member organisation, our customers can enjoy reduced rates for on-track insurance. I’m passionate about running high quality track days, and about their safe and proper organisation. The BHP team has been doing this together from the outset and we consider that we do it well.